Let's Hear It For Ringo!! As an Unsung Hero, Look No Further Than Ringo Starr. 1) First and foremost, Ringo had no big ego issues. While it is true that if you are as good as John and Paul were, ego isssues are somewhat acceptable. It was the emergence of George Harrison later in the Beatles recording career that became one of the fatal weights on the dynamics of the band. George felt slighted by John and Paul because his writing material was getting better and better and they didn't want to hear about it most of the time. Still, throughout it all, Ringo remained low key Ringo. It is my contention that had they had one more ego trip/bruise at the time (1968), it would have been over BEFORE the "White Album" came out. That situation alone makes a great case for Ringo Starr. Now, let's move onto more playing issues. 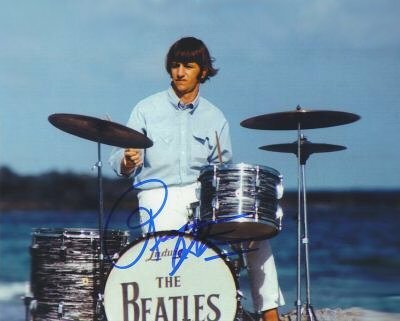 2) Ringo was left handed. Yet, he set his drum set up for a right handed drummer. That together with his "matched" grip of holding both sticks like a fly swatter made for a comepletely unique sound. The "matched" grip was seldom done before Ringo but became the standard thereafter. Ringo was known for heavy use of his tom-toms and the matched grip facilitated that sound nicely. 3) Have you listened to Anthology 1 yet? Pete Best plays on a number of those tunes. Best also played on a lot of the Beatles numbers on the "Beatles at the BBC" collection. Then compare to Ringo. Is there really any doubt as to who the far better drummer was?? 4) Ringo worked closely with engineers Norman "Normal" Smith and shortly thereafter, Geoff Emerick in the Abbey Road Studios. With these stellar engineers, he started creating a singularly unique sound that became widely emmulated in rock: he tuned the drums lower and with Emerick close microphoning each drum in his kit with other sound "deadening" material, the Ringo sound was born. Practially every drummer since then owes a debt to Ringo for it. 5) Ringo never overplayed. NEVER! Some have critisized him for it. I say he should have been knighted for it. 6) Ringo had a facility to play odd and unusual time signatures with ease. This pushed rock into uncharted territories heretofore unknown. For example, the 7/4 timing of "All You Need Is Love," or the frequent time signature changes in "Here Comes The Sun." He also knew when less was more; take "Norwegian Wood" for example. He used a small tamborine and nothing else for that. Ditto "You've Got To Hide Your Love Away." Timing changes were present in his own signature song, "With A Little Help From My Friends." 7) Ringo had a proficiency in numerous and different styles of music; hard rockers (RAIN), ballads, (Something), Country (What Goes On), Calypso (Ob-La-Di,Ob-La-Da) and of course, beautiful Pop (Nowhere Man). He did it all. This ability was a great advantage to superior song writers like John Lennon, Paul McCartney and George Harrison. 8) Ringo was known to feel a song as opposed to playing it. Any musician will tell you that. His uncanny ability to feel a song, which may or may not have required some tempo changes in a particular song, were always appropriate. No one had a better feel for songs than Ringo. 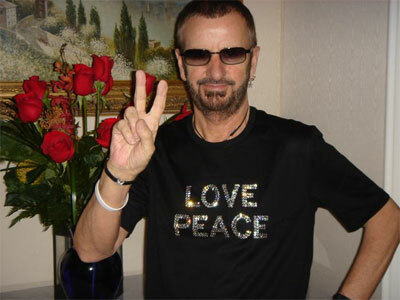 9) The urban legend that Ringo was the luckiest man alive and just happened to fall into the Beatles one day is false. The Beatles expressely wanted Ringo. He was the best drummer in Liverpool and everyone knew it. John, Paul and George felt lucky to have been able to get Ringo in the first place. Add to that, George Martin's displeasure with Pete Best during the Beatles' audition at Abbey Road on June 6, 1962. Martin flat out said, "Get rid of that drummer." That was the straw that broke the camel's back. The Beatles got Ringo in August, 1962. Pete Best was sacked on August 16, Ringo started with the fabs on August 18 and the rest is history. 10) There were rumors that persist to this day the Ringo was so mocked by his own bandmates and that Paul redid drumming tracks behind Ringo's back. Not true. Paul McCartney indeed played drums on three Beatles's tracks as follows: 1) Back in the USSR: because Ringo had just quit the White Album sessions. 2) Dear Prudence: same thing, it was while Ringo temporarily quite the Beatles in August 1968 during the White Album. 3) Ballad of John & Yoko: Ringo was out of the country filming his first movie: "The Magic Christian." Guess how many of these albums Ringo played on?? The first three. This, after all the acrimony, heartaches, breakup and bad feelings between all the Beatles in 1970. Ringo was the drummer of choice for John and George. Paul, not surprisingly, played the drums himself on his own best solo effort. The first three listed here are considered the best of the this short list by far. Ringo was the glue that held the Beatles together far longer than they would have otherwise. The unsung hero of this band to be sure. And a great drummer by any standard. Go and listen to him again now and savor the sound.